To wrap up our series of looks into the IPOs of tech’s Big 5, we turn to Apple. Being the first of five to go public, what can we learn from Cupertino’s debut? Apple’s 1980 public offering came more than half a decade before Microsoft’s 1986 IPO, eras of technology before Amazon’s 1997 flotation, Google’s 2004 IPO or Facebook’s 2012 public market kick-off. Heading back in time as we are, we lack readily accessible S-1 documents that the younger entrants to the group have posted. Instead, in our look back at Apple’s IPO days, we’ll deal with the firm’s IPO prospectus (similar to our Microsoft jaunt). So what was Apple’s story as it raced to the public markets? When you think about Apple today, you probably conjure up the image of an iPhone, or an iPad, or your hatred of iTunes. Given how successful the company’s current product cycles have been, it’s almost too easy to forget that there was an Apple before the iPod. However, back in 1980, there was no such mix of consumer gadgetry pouring out of Cupertino. Apple sold computers. The Company’s principal product is the Apple II personal computer system. Apple II systems in typical configurations may be sold for suggested retail prices as low as $1,850 and up to $5,000 or more […] As of October 31, 1980, Apple had sold approximately 131,000 Apple II computer mainframes. In May 1980 the Company announced the introduction of the Apple III. The Apple III cost comfortably more than the Apple II ($4,300 to $7,800, according to the document). Apple also noted that “approximately 100 independent vendors have developed applications software for use in connection with Apple computers.” That’s an early draft of “there’s an app for that” that the iPhone kicked off. So how lucrative was the PC business back in 1980? It turns out that it was very lucrative. We live in the era of recurring revenue. Microsoft and Apple have both come to appreciate subscription income, as well. Apple wants to sell you Apple Music every month, and Microsoft wants you to subscribe to Office. But back when both companies were just going public, one-off sales drove revenue, which was a very profitable sales strategy. There’s a lot in the image, so let’s walk through it together. Reading left to right, Apple didn’t quite manage $1 million in sales during its first, approximate fiscal year. It still generated net income of $41,575, which isn’t too shabby given how young the company was. Moving temporally forward, Apple put up more than 10 times the revenue result in its fiscal year ending on September 30, 1978. And, notably, its net income grew by far more than 10 times. So the company’s revenue and profit grew. Additionally, its net profit margin expanded. That’s about as good as it gets in terms of growth. By the next year, Apple’s revenue expanded by more than six times and its profit grew a bit faster, at 6.4 times. In its fiscal year ending September 26, 1980, Apple doubled its revenue and profit. For fun, track how close to 10 percent Apple’s net income is as a percent of its revenue through time. Impressive, right? The company today is even more impressive. Apple’s most recent net income as a percent of revenue? Just over 19 percent. So during its infancy, Apple quickly grew while increasing profits. The company would later fall into difficult financial times, most famously culminating in the return of Steve Jobs as interim, and later permanent, CEO. Eventually, the company also took on a massive investment from Microsoft. But, at the time it went public, Apple was piling up net income. Approximately $1.7 Billion in 1980 dollars. Apple went public on December 12, 1980. I have not been able to find the exact marke[t] cap on that day (just the price per share), but as of December 30, 1980, the market cap was $1.7 Billion. Quick math on the total Apple shares at the $22 price kicks out a lower number, but we can safely put it somewhere near Rabois’s figure. Regardless of the exact market cap, we know Apple had $11.7 million in trailing profits and was doubling revenue. Yet that growth still placed its value at less than $2 billion. It’s a fact to keep in mind when looking at modern valuations. Does 15 percent seem light for Jobs? 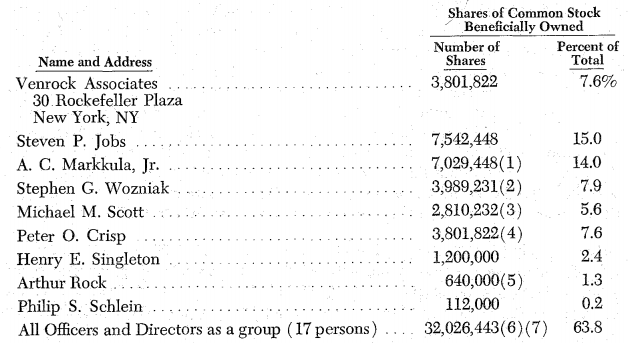 Recall that when Box went public quite recently (in terms of Apple time, at least), CEO Aaron Levie owned less than 6 percent of the company. What happened next at Apple is well-tread history. There’s no need to recount it here. But something that I did pick up on writing this short series with you all is the power of market adoption. The companies that became the Big 5 tapped into mammoth demand and managed to (Amazon aside) quickly tap a profitable vein. Now, you can build an incredibly valuable company while losing money. But it seems that those firms that become the biggest didn’t have to.